butter | What's for tea tonight dear? We were entertaining the Anthropologist for a birthday lunch and with a guest who takes such care over her own entertaining a degree of effort is essential, such as making a new dish, or sacrificing several days and your sanity to prepare a little something from Heston Blumenthal [or, as on this occasion, both!]. And whilst there’s nothing new about chicken liver paté per se, I’d never done it before, so for me it counted. I think I’d always imagined it would be a complicated business, but it turned out to be a surprisingly simple affair [unlike what was to follow!]. You can make it with just some sautéed livers, a splash of booze and some melted butter and seasoning – or you can phaff about a bit more, as here. This will make enough for four, twice over, plus a little extra for a solo lunch or two. Place the chopped shallot or onion, bay leaf and mace in a small pan. Add the booze, bring up to a simmer and allow to reduce until the liquid has all but gone. Discard the bay leaf and mace. Sautée the livers in a knob of the butter for three or four minutes each side. You want a nicely browned exterior and a pinky middle. You can finish them off with a glug of brandy in the pan and a quick flambé – by no means essential, but why waste an excuse for a bit of flambé drama?! You’ll feel more like Graham Kerr, and who could resist a paté made by the Galloping Gourmet? Melt the remaining butter. Tip the shallot and livers into a food processor, with any liquid and pan scrapings from the livers, and blend, adding the melted butter and a good splash more of your chosen booze as you do. 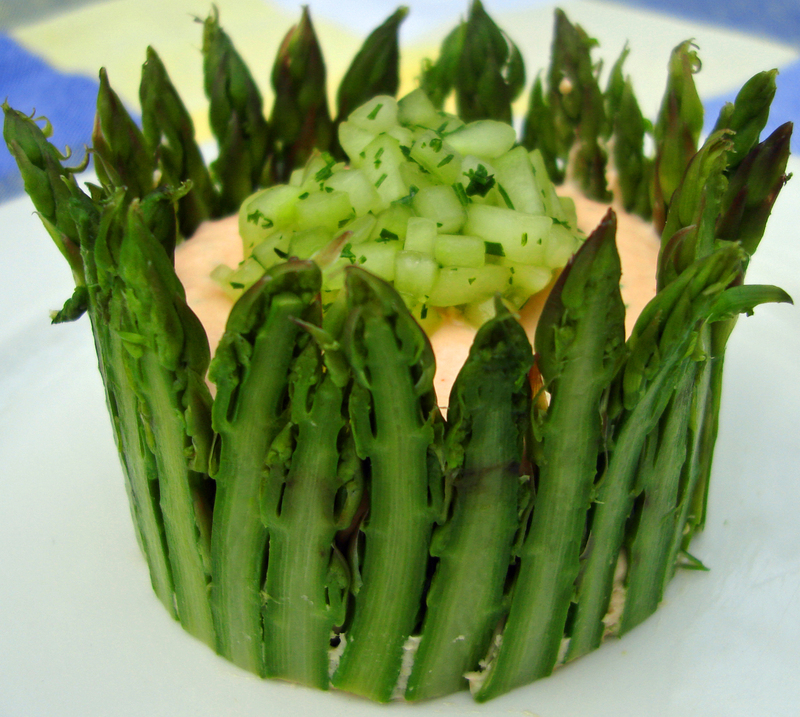 Season well, and scrape the paté into bowls or ramekins. 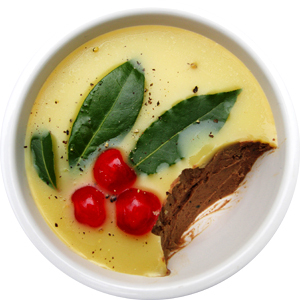 Top with some clarified butter and decorate with bay leaves, pink peppercorns, cranberries and a grind of black pepper – or whatever takes your fancy. In the absence of anything else I ended up using halved glacé cherries. Chill for a few hours or overnight, but do remove from the fridge a while before serving. Sorry, not had much time to post lately. Bloody working for a living and all that. So until normal service resumes here’s a repeat from last Easter which went down very well at the time – both online and on the plate! Apologies for the James Martin style egg puns but this is an ideal recipe if you find yourself with too much Easter chocolate on your hands, especially if that includes 350g of dark chocolate and a packet of Cadbury’s mini eggs. I can take no credit for the recipe which belongs to Dan Lepard of the Guardian – only the decorative tweaks and techniques are my own. Dan’s recipe produces a very easy to work crust [although I used an extra egg yolk and a splash more water] which can be rolled to less than the thickness of a £1 coin. The key thing is the freeze chilling. I also doubled the quantity of bourbon in the filling [hic!]. 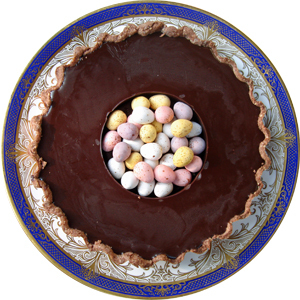 To make a well in the centre which can be filled with mini eggs or whatever you fancy [raspberries would be good when in season] pour half the filling into the baked pastry base and chill to set. Meanwhile keep the rest of the filling liquid over a barely simmering bain marie [see the temperature guides in the original recipe]. When the first half has set [after about 10 to 15 minutes] place a glass or jar in the middle and pour the rest of the filling around. The first time I did this I used a metal moulding ring which was a mistake – a glass or jar gives you more purchase when you come to gently twist and remove it which you should do once everything is completely set and after the tart has been out of the fridge for a few minutes. If using fruit pile it high and allow it to spill over the edges of the centre well. This is less easy however with chocolate eggs. And if you haven’t spent enough time recently in your local cardiac unit you could serve this with cream, but it is easily rich enough without. By slavishly following post heart attack dietary advice for over twenty years my late father ate so much smoked mackerel that he came to loath it with a passion. But then my parents always treated even the most casual advice from someone with a white coat and stethoscope as something not to be simply heeded, but rather carved in tablets of stone and set upon an altar. Ironic then that when the family recently gathered at the home the of my eldest brother, for the sole purpose of relocating our dear departed parents’ mortal remains to a dedicated area of woodland in the Lancashire hills, that I should be treated to a lunch of smoked mackerel pate. The fraternal recipe, borrowed from a farmer neighbour, consisted of just smoked mackerel and cream cheese [with I suspect a fish to cheese ratio of c.2:1] simply blended together. And quite delicious it was too. If you want a more straightforward approach than what follows then I can highly recommend it. Remove the delicate bloomy rind from the cheese carefully with a sharp knife so as to minimise any cheese loss. I’d never bother to do this if just eating the cheese but the flavour of the outer layer isn’t what you want here. Then just tip all the pate ingredients into a food processor and give it three or four good blitz pulses. The texture is up to you – for a coarser pate blitz less, for smoother blitz more. Check the seasoning and spoon into one big dish or a number of small ramekins. Chill. You don’t need to top this but it does look pretty and takes no time at all. Mix the chopped parsley into the melted butter and gently pour or spoon a thin layer over the pate. Add the capers or peppercorns, and press a few whole leaves of parsley artfully into the butter. Once the butter has begun to set [after just a minute or two in the fridge] sprinkle over a little more cayenne pepper. If you do this when the butter is too liquid the little red jewels will all disperse instead of sitting prettily on the top. 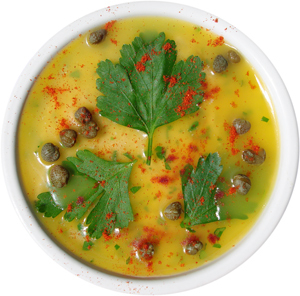 Serve with bread or toast, and few more capers or some cornichons or gherkins on the side. Not a republican call to arms, but time to celebrate the start of this year’s Jersey Royal season! A few years ago we were lucky enough to be visiting friends in Jersey in early March, and driving round the island on a gloriously sunny Sunday we found the first Jersey Royals of the season for sale in a farmer’s ‘honesty shop’, a shed full of produce with a box for you to leave your payment. I was as excited as a Yukon gold miner and dashing home with them felt like being on the old Beaujolais Nouveau run [does anyone else remember when that actually used to make the 6 o’clock BBC news?]. It being the Shopkeeper’s birthday we were due to meet friends at the local bistro for dinner, and my breathless call on landing at Gatwick was the first, and so far only, time I have phoned ahead to a restaurant to ask if the kitchen would mind if we were to bring our own potatoes! I can only hope that if it happens again our hosts will be as accommodating as Brula were that evening. Last year was an altogether different story. The drawn out winter chilled the island’s coastal fields for months and had us forlornly scouring the empty shelves well into early May. I remember speaking to a man whose job title was roughly along the lines of ‘The States of Jersey’s Potato Ambassador to the Court of St James’ at last year’s Real Food Festival when he’d managed to bring just one sack of potatoes to Earl’s Court, and had made some mortal enemies by removing even those from their native soil with supplies so short. 2011 though has been far kinder and the Jersey Royals have now landed, with this year’s first consignments arriving on the mainland in the third week of March. The most exciting part of cooking with the seasons is the change of season when the yearly re-appearance of old favourites is like the greeting of old friends you haven’t seen for far too long. 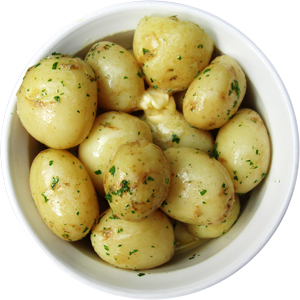 And nothing says “Spring’s here!” like a bowl of Jersey Royals. I bought a bag last week and the sun shone for three days in a row, what more empirical evidence could you need? There are things you can do with Jersey Royals besides boiling them and serving with lashings of butter, but why would you when the simplest treatment produces such majestic results? If you really must then the Atlantic Hotel’s canapé with lemon mayonnaise and caviar sounds suitably regal. But if like me your budget doesn’t run to such things just follow these simple dos and don’ts and enjoy these precious jewels wearing little more than the emperor’s new clothes. boil or steam until just tender, checking often. The exact time is likely to be between five and ten minutes but this will depend on crop, size, and whether boiling or steaming. anoint their majesties with plenty of melted butter or [and only if you’re allergic to butter] very good olive oil. swirl in a little chopped parsley and maybe just a leaf or two of chopped mint [no more] with the butter. only use in salads if you have excellent quality or homemade mayonnaise available. under any circumstances, add mint to the cooking water! mash, although a little light crushing is OK and can help the potatoes to absorb more butter.